I don't typically read books set at the turn of the century, but recently I've read several set at the end of the 1800s, early 1900s. And you know what, I've really enjoyed them. 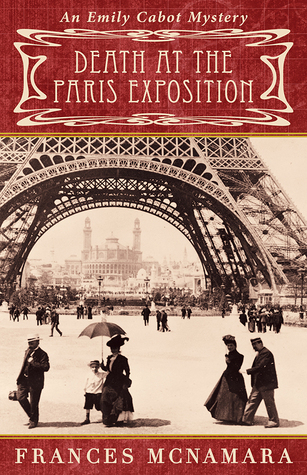 Death at the Paris Exposition is set in 1900 and I was thoroughly invested in the story. Amazon affiliate links are used on this site. This book was won during Armchair BEA. This is my first Emily Cabot mystery and while there is some backstory I'm missing, it didn't impact my enjoyability. I really looked forward to getting back to the story each night. While fashion isn't really my thing (and the detailed descriptions became a bit tedious, especially when it pulled me away from the mystery), I still liked the glamorous feel it gave the book. I've been watching The Collection on PBS and though it is set after WWII, it provided a great visual for what Parisian fashion was like in 1900. Then there is the excitement of a World Fair - at a time when electricity and moving sidewalks were still novelties. There are great descriptions of the venue and various pavilions. It was definitely a great setting. I loved the characters. Emily is a definitely a progressive woman - she teaches at a university in Chicago. I'm not sure exactly her field but it has to do with forensics or criminology as she often works with a detective in the city. In Paris, she is surrounded by some real historical figures and they all come off the page. The personalities of each character play well off the others. You really couldn't ask for a better cast of characters. Now, the mystery was awesome. I had my suspicions of who was involved but didn't guess fully the motivations. And there were enough twists that had me questioning my guess every few pages. If you enjoy the mysteries of Rhys Bowen and Vivian Conroy, then you definitely need to put Frances McNamara on your reading list. I know this won't be my last Emily Cabot novel.